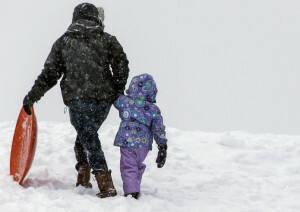 Max Mejia walks daughter Itzayana up the sledding hill at the Eastern Prom after a final run for the day. Above: Max Mejia walks daughter Itzayana up the sledding hill at the Eastern Prom after a final run for the day. Right: Zola Bloom, left, and Stella Halstead, zoom past trees on the edge of the sledding hill.